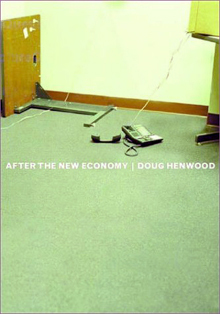 Doug Henwood is the author of three books, After the New Economy, Wall Street, and The State of the USA Atlas . Published by the New Press, October 2003. Forthcoming in paper, June 2005. One of Newsday's best books of 2003. Fast, funny and consistently merciless toward the purveyors of economic delusion and deception. I feel ten times smarter than I was before I read this book! Here, finally, is the touch of the real thing, the antidote to the flourishing fashionable anti-capitalism in today's academia - like a glass of freshly squeezed orange juice after a chemical 'orange drink.' If Doug Henwood were not to exist, he would have to be invented: the will to change the situation is organically inscribed into his precise economic analyses. My dream is that no only economists and sociologists, but also everybody in Cultural Sciences will read this book! Doug Henwood is a wicked genius who makes you laugh while pointing out the most horrific consequences of capitalism's most titillating hours. After Doug Henwood's scorching appraisal, all that remains of the new economy boosters is a faint smell of burning plastic. Rarely a day went by in the dizzy 1990s without some well-paid pundit heralding the triumphant arrival of a "New Economy." According to these financial mavens, an unprecedented technological and organizational revolution was ushering in an era of rapid productivity growth and had extinguished the threat of recession forever. Mass participation in the stock market would transform workers into owners, ideas would become the motors of economic life, and globalization would render national borders obsolete. Though much of the rhetoric sounds ridiculous today, few analysts have explored how the New Economy moment emerged from deep within America's economic and ideological machinery. Instead, they've preferred to treat it as an episode of mass delusion, stoked by stock touts and creative accountants. Now, with customary irreverence and acuity, journalist Doug Henwood dissects the New Economy, arguing that the delirious optimism of the moment was actually a manic set of variations on ancient themes - techno-utopianism, the frictionless market, the postindustrial society, and the end of the business cycle - all promoted from the highest of places. Claims of New Eras have plenty of historical precedents; in this latest act, our modern mythmakers held that technology would overturn hierarchies, democratizing information and finance and leading inexorably to a virtual social revolution. But, as Henwood vividly demonstrates, the gap between rich and poor has never been so wide, wealth never so concentrated. For all of capitalism's purported dynamism, the global economic hierarchy has remained remarkably stable for more than a century, and few regions of the world enjoy bright economic prospects. For a while, it looked like the U.S. was a fortunate exception, but it too has been stumbling since the bubble burst. After the New Economy offers an accessible and entertaining account of a less-than lustrous reality beneath the gloss of the 1990s boom, stripping bare the extravagant pretension of unrestrained entrepreneurial hubris and revealing how it contributed to the making of a new anti-capitalist global movement. First published by Verso in hardcover in 1997, and in paper in 1998. Verso chose not to reprint it when stocks ran out in 2004, so it's now available for free download on the web. To download Wall Street, click here. Doug Henwood has a talent, remarkable as it is rare among observers of the financial scene, for making the obscure clear, the complicated simple and the arcane understandable. His irreverent take on Wall Street is a provocative challenge to conventional wisdom that's great fun to read. The changing face of American life in maps and graphics. Though Simon & Schuster did nothing to promote this book, you can order it here.